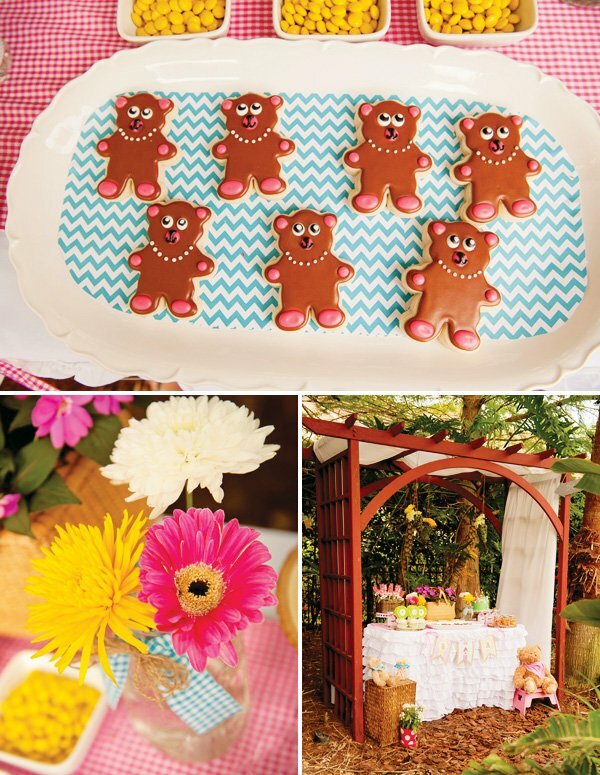 Maureen Anders, of Anders Ruff, here to share the perfect girly summer Backyard Teddy Bear Picnic Party by Ellen Bessette Events. 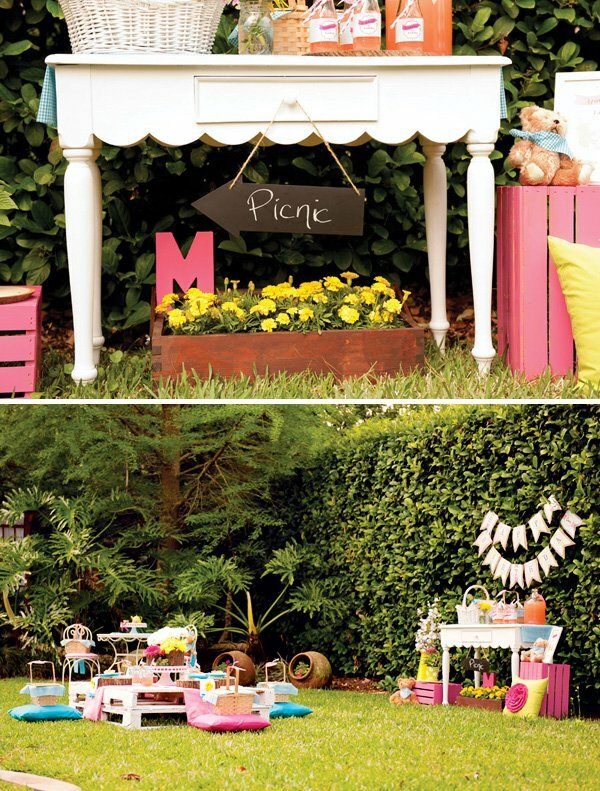 Ellen’s backyard was transformed into a whimsical and colorful picnic area for the little girls (and their favorite teddy bears!) to enjoy a 3rd birthday celebration. 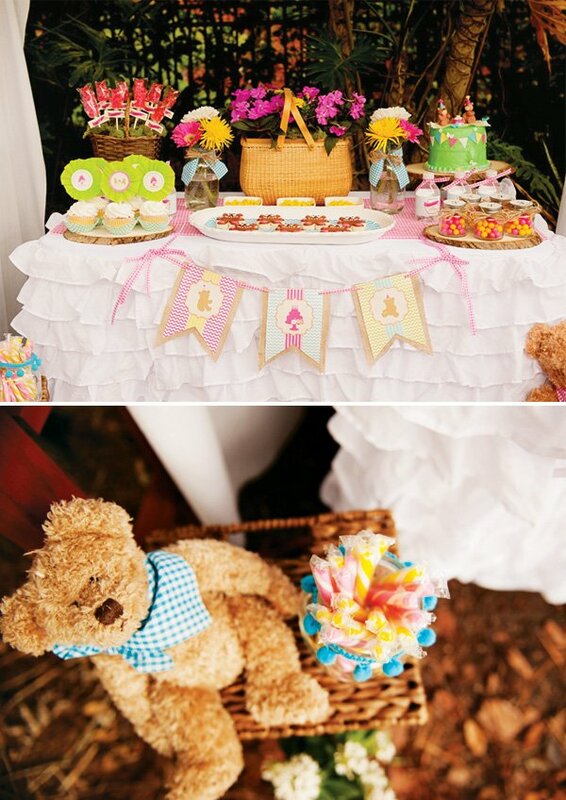 Teddy bears, three-year old girls and a picnic! 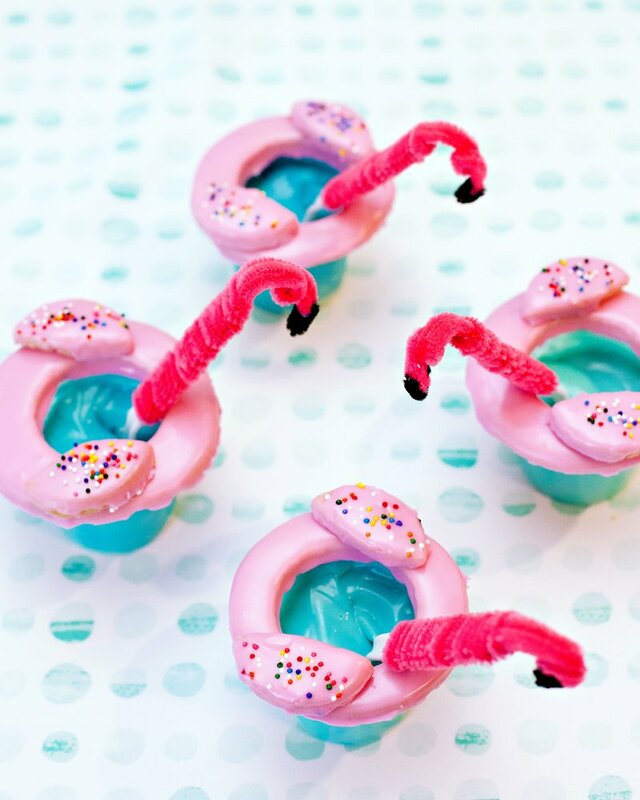 It was such a sweet party! I was trying to keep things simple since I had limited time to really plan this party. 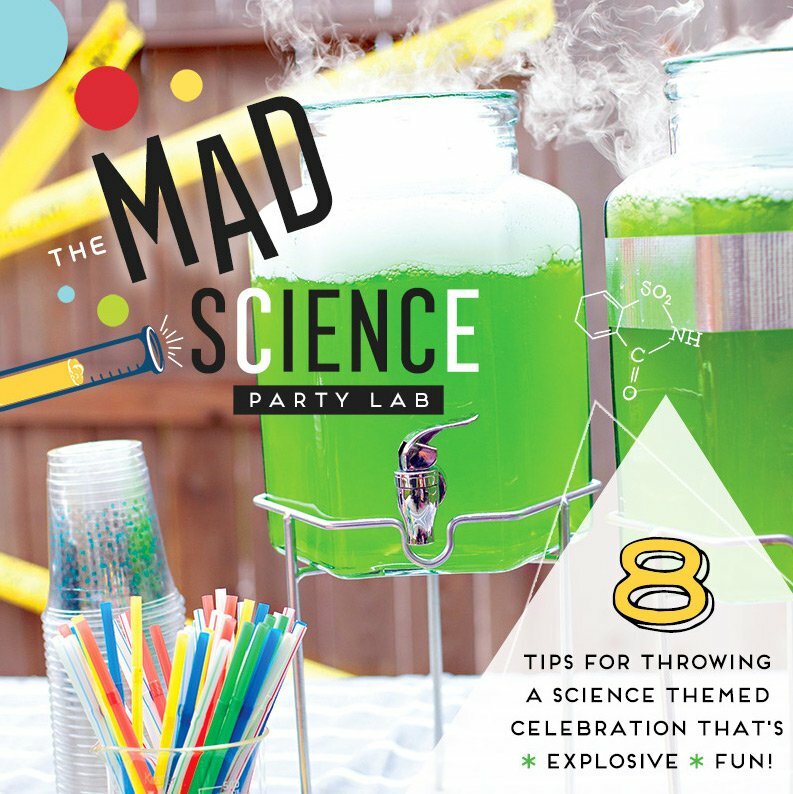 For those that like simplicity, this is the party theme for you! The color palette was hot pink, turquoise, yellow and green. 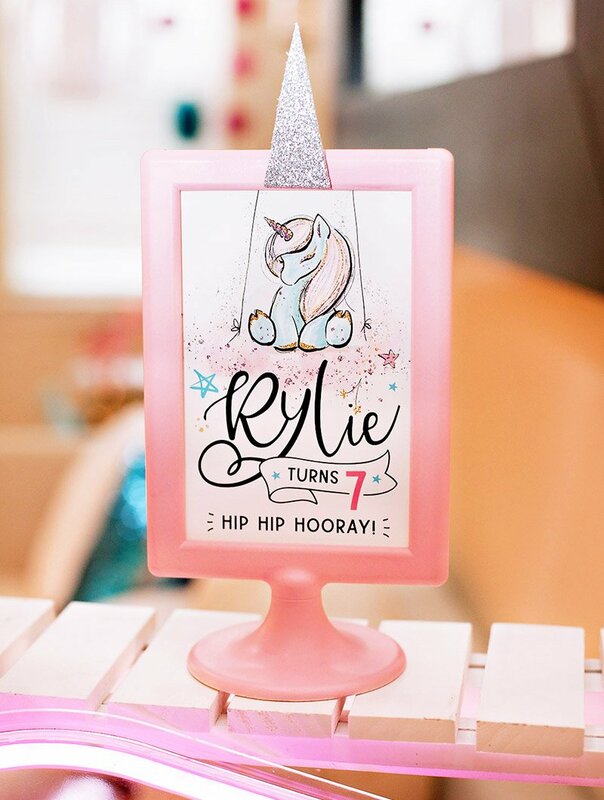 I loved the party printables that Anders Ruff designed for me. 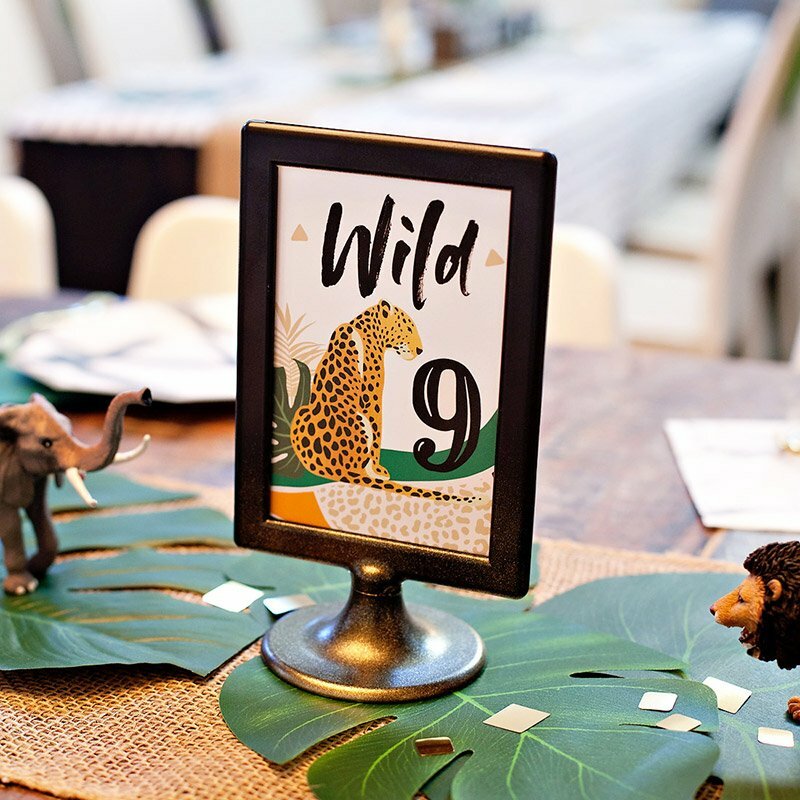 The modern bears, bright chevron & polka dots and light wood grain design were perfect for this party and tied everything in nicely! The guests came in with their pretty dresses and favorite teddy bears and dolls. I wanted to keep it casual and initially thought a blanket would do for their picnic but I decided that I wanted a little table for them to sit at while eating their lunch. I painted wood pallets and stacked them to make a mini-table. 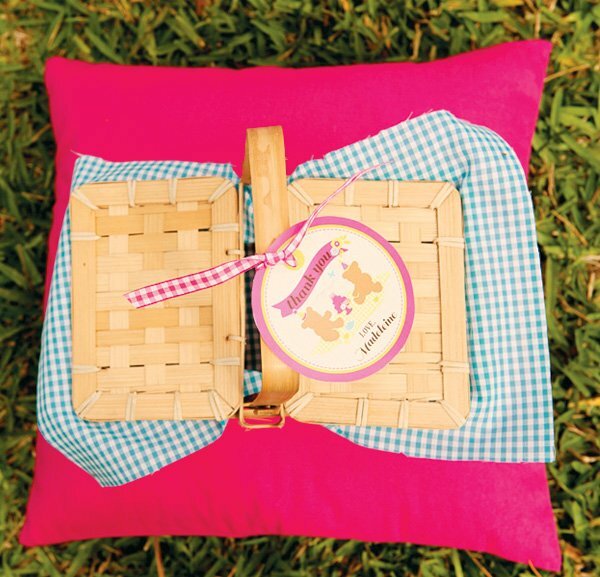 I found pillows for the girls to sit on and lined their picnic baskets with the matching fabrics I used throughout the party. 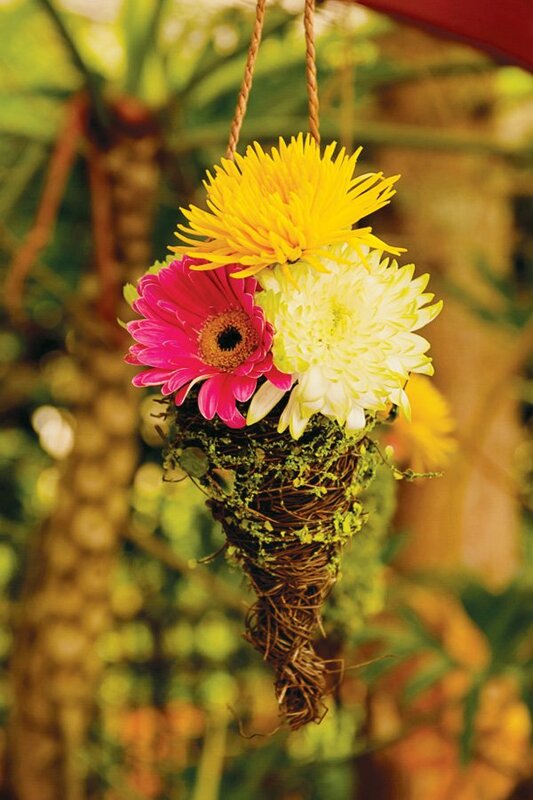 To tie in the outdoorsy feel, I used wood chargers and filled tree trunk vases with simple flowers. I wanted to incorporate mason jars I had in my pantry so I used those for their drinking cups and wrapped them in fabric and twine. I embellished simple white napkins with turquoise poms and flowers and had a small treat waiting for them consisting of teddy grahams, mini-marshmallows and raisins. The girls loved sitting around their little table to picnic with their favorite lovey! 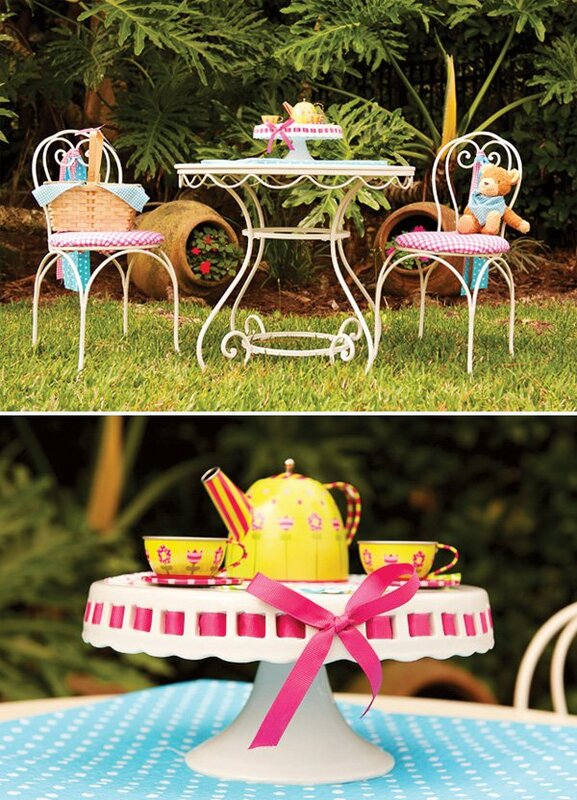 Nearby, I had a whimsy table and chairs for the girls to play and have a tea party with their bears. I covered the chairs in coordinating hot pink gingham and tied long pieces of fabric behind the chairs. 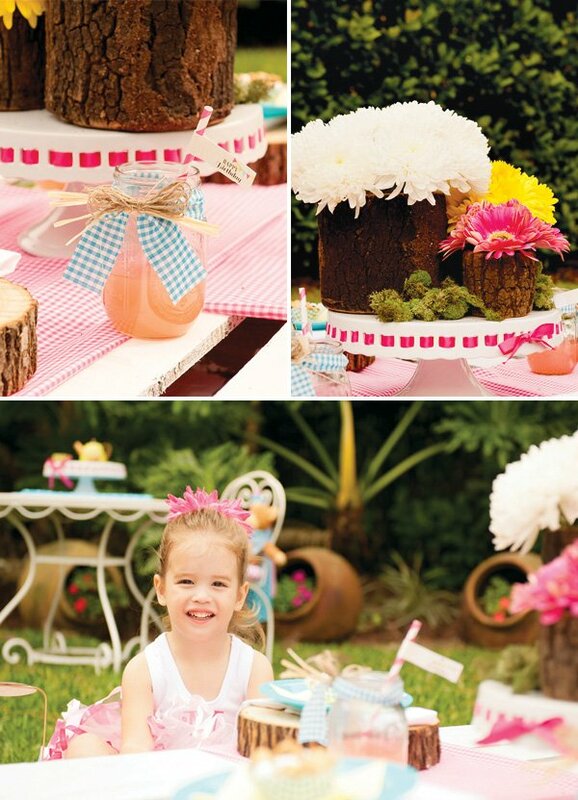 On the tabletop, I placed a pink/green tea set where the girls sipped tea and giggled away with their friends. 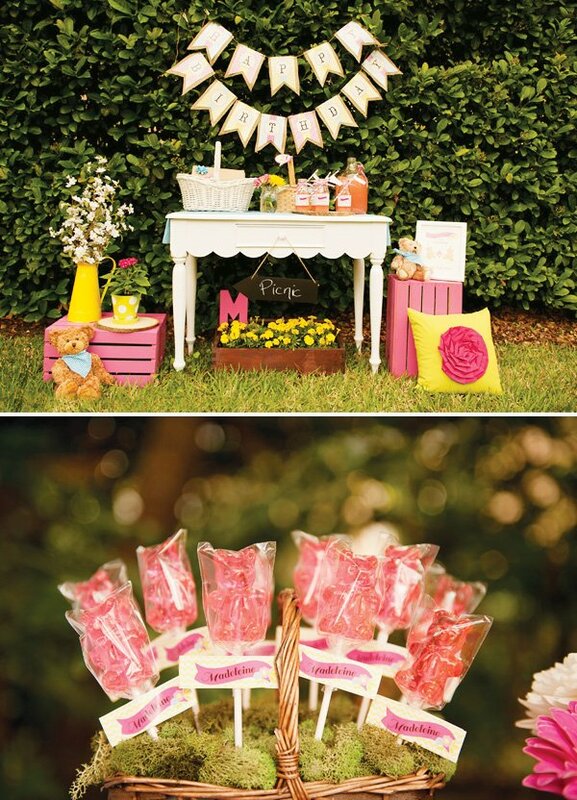 The dessert table was nestled among trees and underneath an arbor draped in white fabric. I hung fresh flowers over the dessert table using twig cones. A picnic basket filled with flowers was the centerpiece on the table along with mason jars with fresh flowers complimenting the picnic theme. 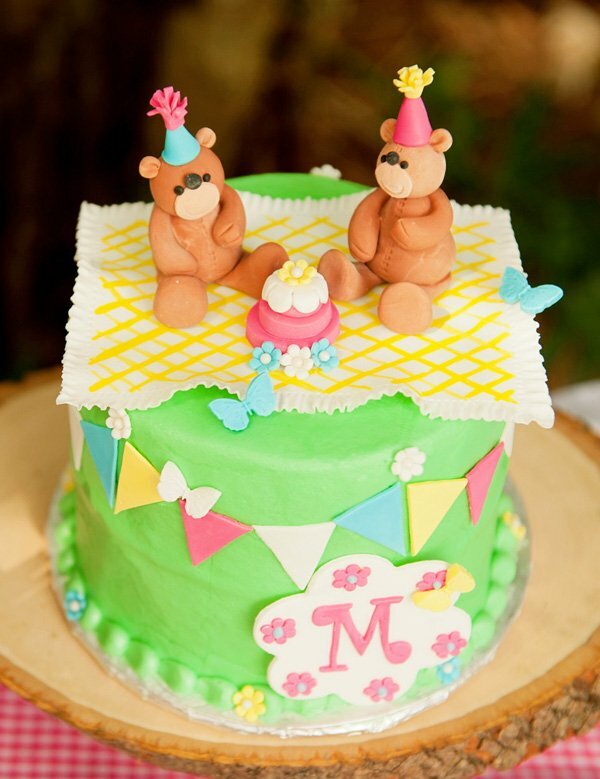 The adorable cake (from Everything Cake) was inspired from the party invitation and stood on top of a tree trunk cake stand. I found the cutest teddy bear lollipops and placed them in a mini-picnic basket with green moss. 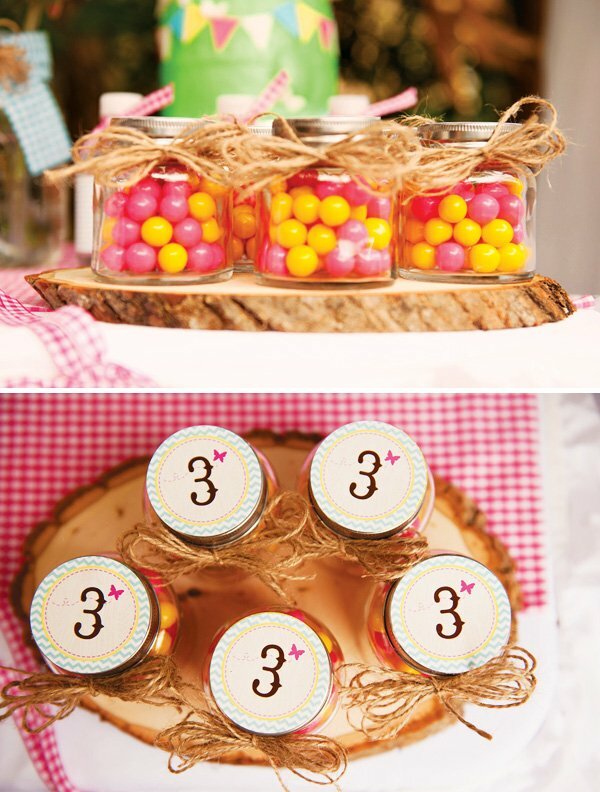 Small glass containers were filled with gumballs and embellished with twine and the Anders Ruff 2″ party logos. Custom bear cookies were a favorite and cupcakes adorned with cupcake toppers from Anders Ruff’s collection tied in the party theme perfectly. For party favors, each girl went home with a copy of a Teddy Bears’ Picnic. 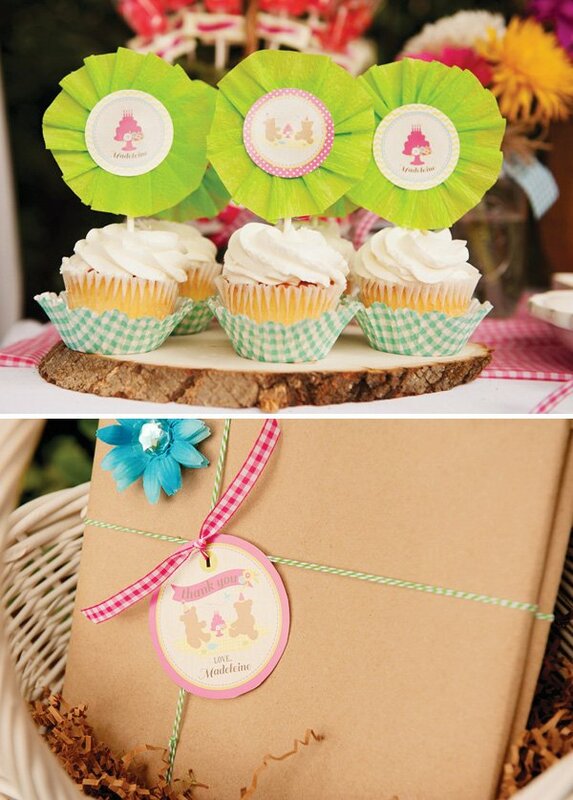 They were wrapped in brown kraft paper, tied with bakers twine and customized with a favor tag from the Anders Ruff Teddy Bear Picnic Printable Collection. 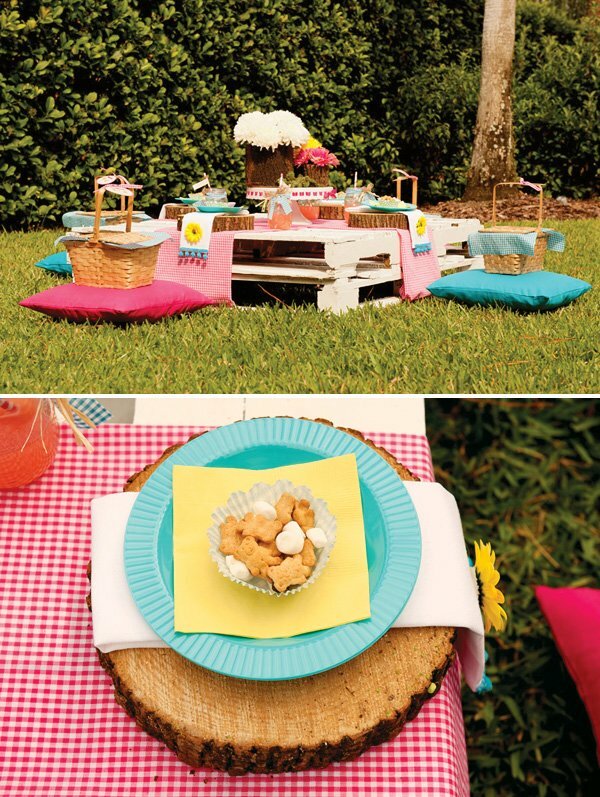 Some of my favorite things from the party were the party printables designed by Anders Ruff, the gorgeous cake, the Recycled wood pallets painted and turned into a small table, the Mini picnic baskets lined with gingham fabric and the printable banner backed with gingham fabric. I loved bringing in wooden elements such as the tree trunk vases, the thick wood slices used for chargers under the plates and the hanging flowers over the dessert table in the twig cones. There were lots of precious moments at this party. 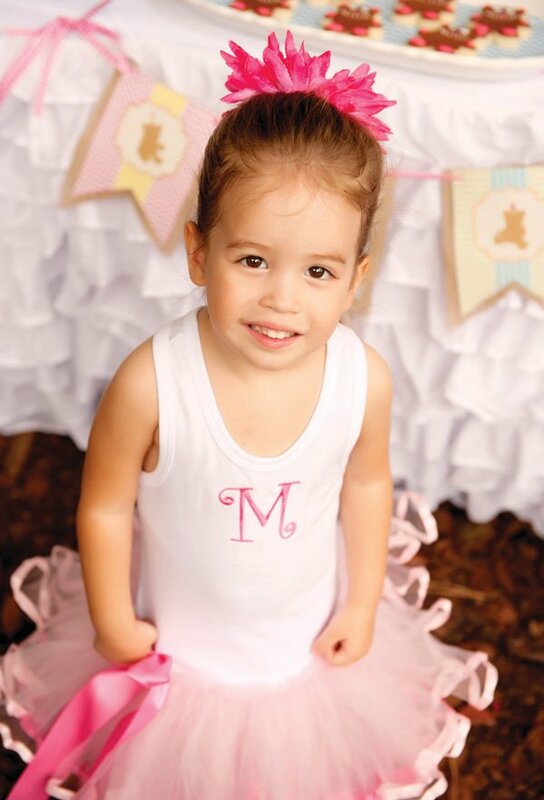 Sweet little girls holding onto their favorite teddy bears and dolls, pretty dresses and bows and tiny giggles throughout the party. They enjoyed jumping around the bounce house, face painting and of course picnicking with their favorite teddy bear! MAUREEN ANDERS is the owner and creative director of Anders Ruff Custom Designs, the ”go to” shop for unique and stylish printable invitations, decor and party accessories. Anders Ruff equips the modern hostess with the beautiful details needed to make their events memorable. 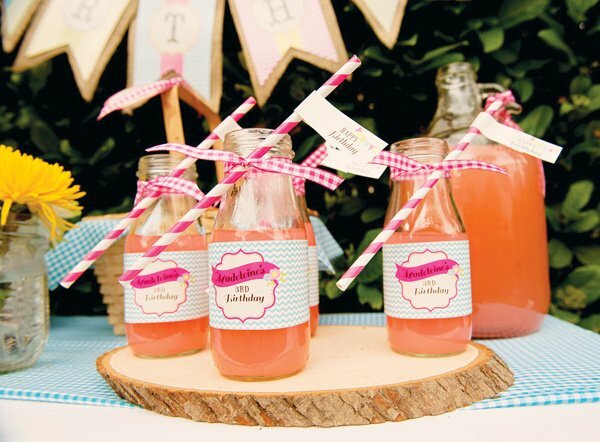 They also offer inspiration for the entire party planning process via their blog. Maureen’s degree is in Engineering, but her true passion is designing and creating. 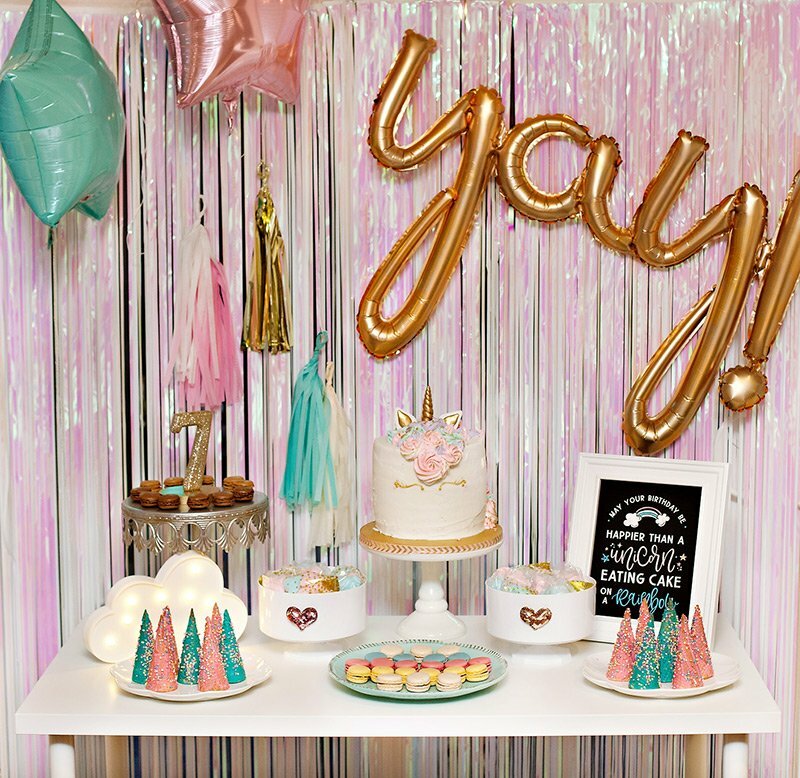 When she left her career in medical sales to stay home with her first son, she was drawn to styling parties, and particularly to adding the small details that take parties over the top. Self taught in graphic design and business driven, Maureen has watched her business flourish because of hard work, passion and an eye for detail. She enjoys the challenge of keeping her designs fresh and unique in the ever changing party industry. Anders Ruff has been commissioned by Better Homes and Gardens, Universal Studios, and Target; and has also been featured on Access Hollywood, Brides Magazine, Hostess With The Mostess, Amy Atlas and more. I love that little scalloped table — so precious! Great job, Ellen! I love, love, love the little bear cookies! So cute! 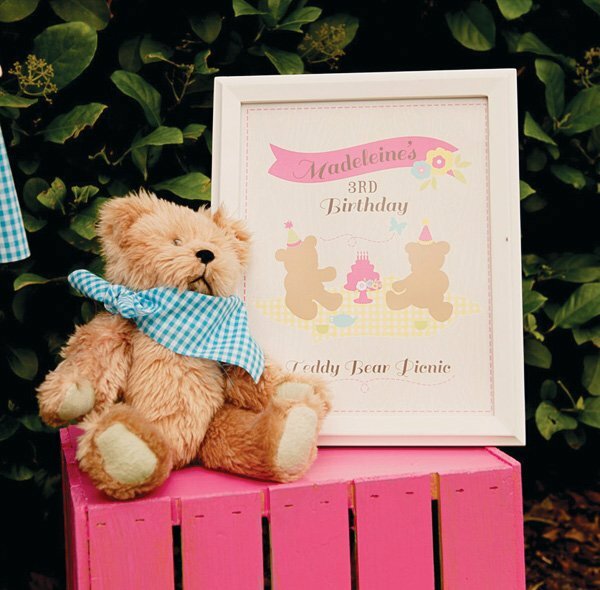 Great birthday party ideas for a make a bear birthday party.